Ever since Captain Rex mentioned serving alongside Ahsoka Tano from the Battle of Christophsis to the Siege of Mandalore in the Star Wars Rebels episode ‘The Lost Commanders’, fans have been aching to learn more about the pair’s final mission together. 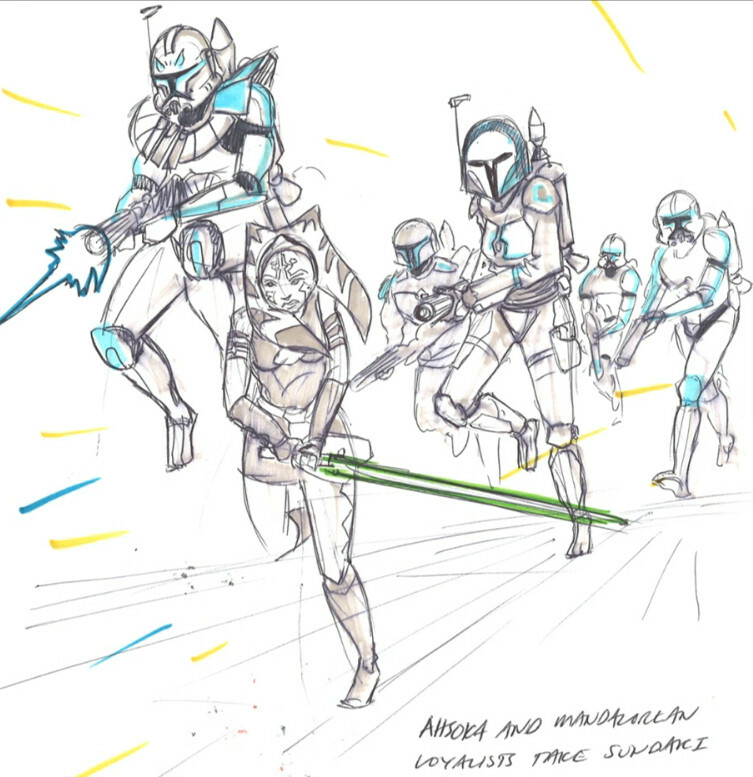 Granted, Ahsoka’s mission to Mandalore was nothing entirely new. 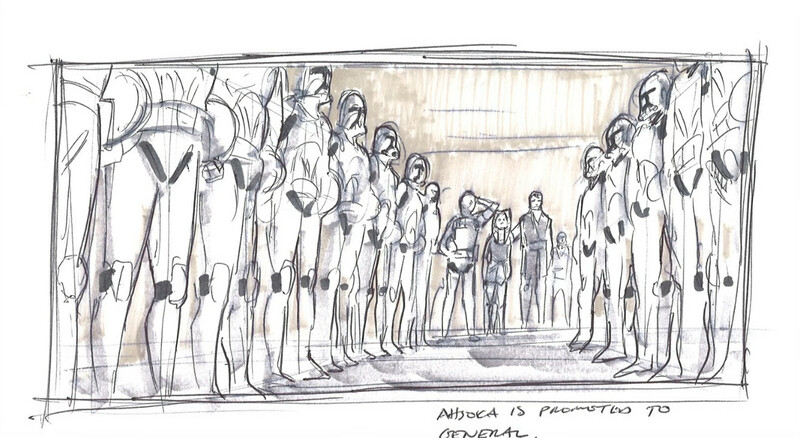 Those who watched the Untold Clone Wars panel back in April 2015 would already have been familiar with some of the details and storyboard sketches that were brought up at this year’s Star Wars Celebration. But for the majority of fans, this pivotal moment in Ahsoka Tano’s history was complete news to them and, judging by Ashley Eckstein’s tearful reaction, a lot of it was news to her too. The circumstances surrounding Ahsoka’s reunion with Anakin Skywalker and the Jedi Council were discussed in part 3 of the panel, “Return to the Jedi”, and while the former Padawan refused all offers to rejoin the Order, it was clear that she still held Jedi ideals close to her heart and that she could work alongside the Council to serve the greater good. As Dave Filoni (Supervising Director of The Clone Wars and Star Wars Rebels) pointed out, Ahsoka still trusted Anakin and Obi-Wan so she did still have people she believed in and wanted to help in this time of crisis. 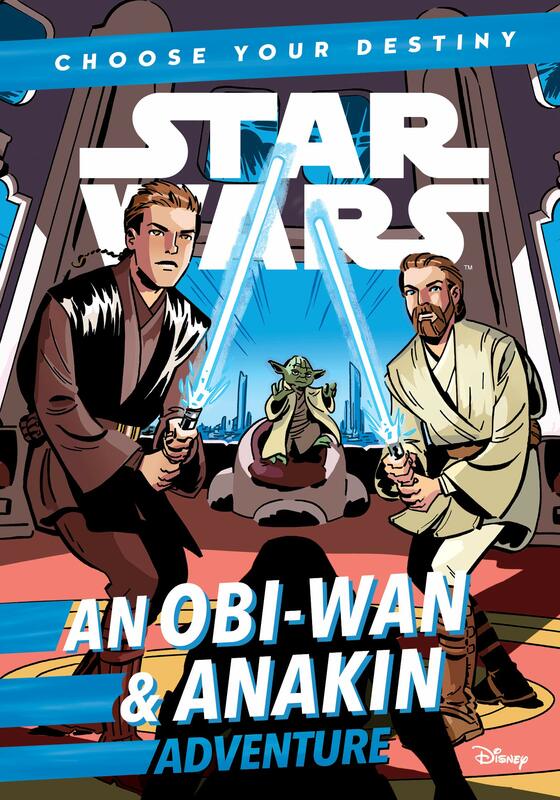 And the final arc of the series (which was planned but sadly never completed) would have seen Ahsoka and Anakin reunited one last time before Anakin’s fall to the Dark Side. The two would have then gone their separate ways and not seen each other again until their fateful showdown in ‘Twilight of the Apprentice’…and we all know how well that reunion went. 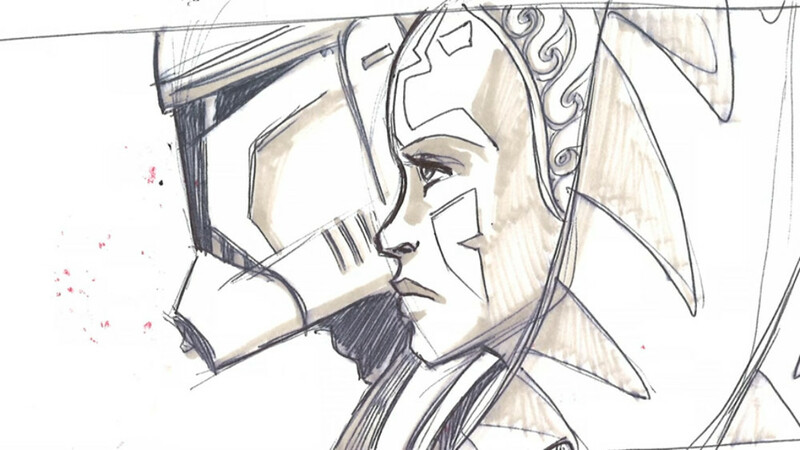 Filoni’s sketch of Anakin and Ahsoka’s final reunion appeared on the screen, causing quite a stir amongst the panelists. “This is heartbreaking”, panel host David Collins exclaimed, “Especially after the season two finale. I see that and it just stirs up a lot of emotion about the last time they saw each other”. He clearly wasn’t the only one feeling this way and eager to know more. And as Filoni started sharing the story of this final encounter with the audience, actress Ashley Eckstein couldn’t help getting caught in a wave of emotion. “So, what happened was that Ahsoka was working with the Mandalorian Bo-Katan“, he explained, “And Bo-Katan figures out when Maul is back on Mandalore, because Maul has been a shadow terrorizing them and was still wielding control over them politically through Prime Minister Almec. Very complex politics in The Clone Wars, remember”. “So they realize he’s back on Mandalore”, Filoni continued, “and they have an opportunity to get him. And [Ahsoka] knows that that’s really important to Obi-Wan and that if it’s important to Obi-Wan, it’s important to Anakin. So she and Bo-Katan contact the Jedi and say ‘We have this opportunity. We know where Maul is. We can get him'”. Before Anakin sets off to rescue the chancellor, he and Ahsoka share one last conversation. 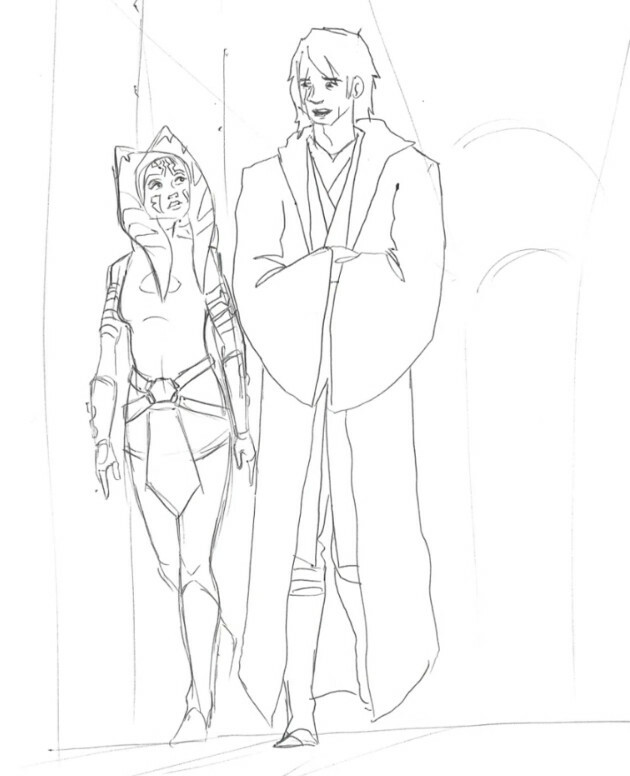 “What happens is that there’s this nice long walk down the hallway, where Anakin expresses how proud he is of Ahsoka and everything she’s achieved. And that even though she left…he’s not completely about it still but he gets it”. At this point, Ashley was looking rather moved by what she had heard, something that hadn’t escaped Filoni’s attention. “Don’t get emotional”, he consoled her, “You’ll be fine”. Coming back to the scene itself, Filoni explained that Anakin wouldn’t have wanted to leave Ahsoka on this mission unprotected. “And then these hangar doors open up and reveal all these clones standing there from half of the 501st. And they’re all now wearing orange striped helmets like her. And Rex is there. And Anakin has given Rex’s command unit to Ahsoka to go and attack Mandalore with Bo-Katan and take back the planet”. “Are you trying to make us cry?”, joked Collins. Well, if that was Filoni’s intention, he certainly succeeded with at least one person as Ashley could be seen trying to fight back the tears. “What’s wrong with you? That’s exciting, that’s happy”. I can’t say I blame Ashley for tearing up after hearing all this. Hearing Filoni describe this scene only makes me mourn the cancellation of one of the best animated series ever created. 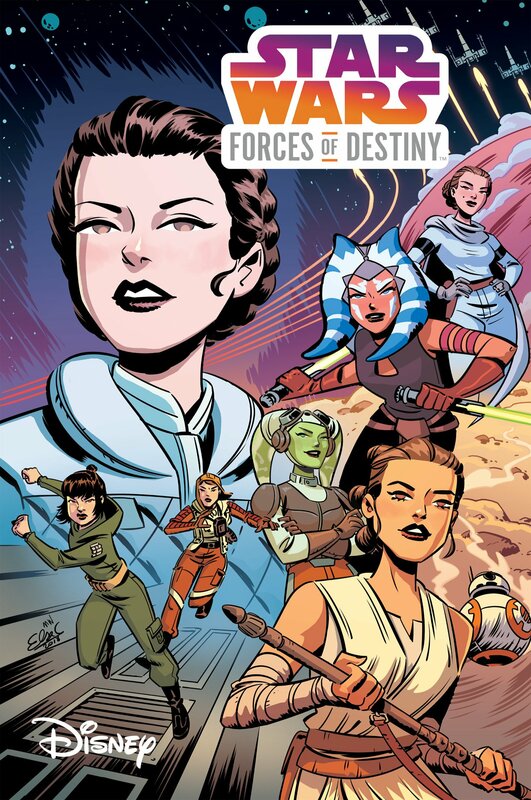 One can only hope that we’ll get to see the completed Siege of Mandalore arc on our screens some day. 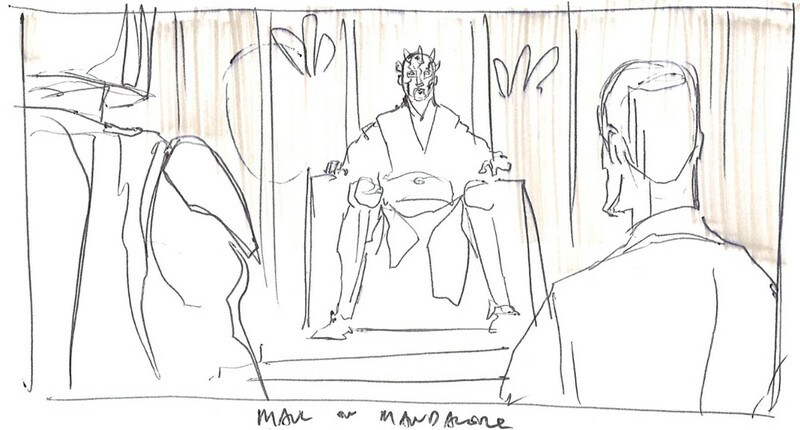 Filoni and Hidalgo continued going through the sketches. “Look at Sam…I mean, Maul…on his throne”, Filoni joked before the next slide came up, which showed Ahsoka leading Rex, Bo-Katan, and a number of clone troopers and Mandalorian soldiers into battle. “This is exciting, though. Leading the charge”, Filoni commented, trying to cheer up his distraught co-panelist. “She looks happy there. Look at that. Clones have jet-packs. Mandalorians have jet-packs. A massive aerial battle. Dogs and cats living together. It’s incredible”. 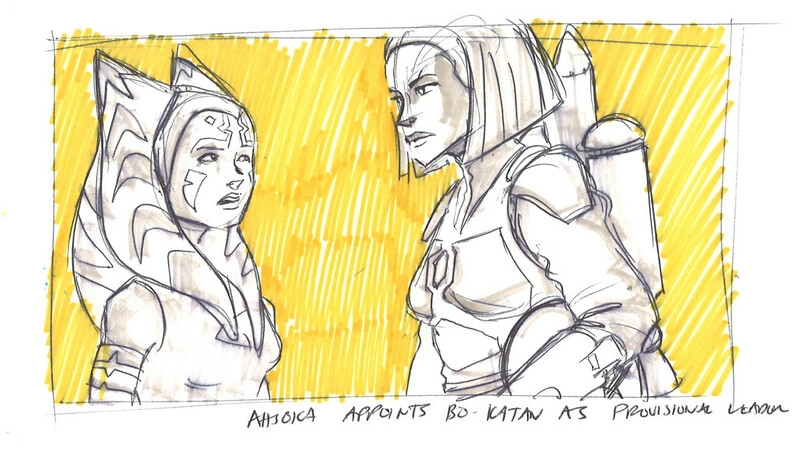 “This is amazing!”, Ashley exclaimed as the slideshow cut to a sketch of Ahsoka Tano appointing Bo-Katan as the provisional leader of Mandalore. “I was told she was hanging out on a pony farm”. 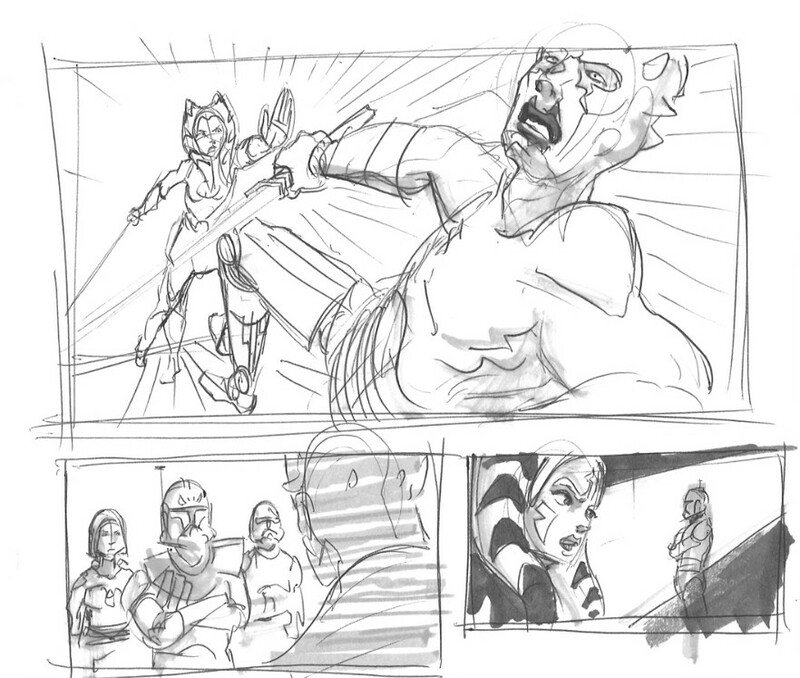 The next sketch showed Ahsoka Force-pushing Maul. 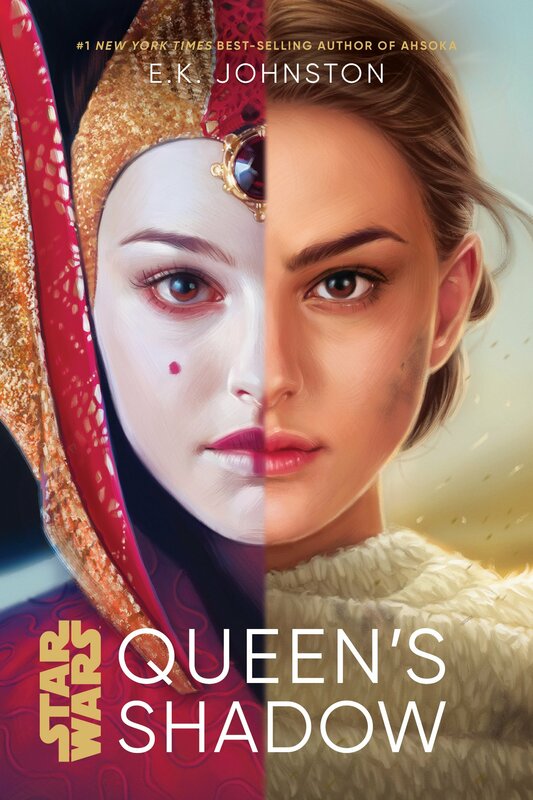 “It would have been a full-on confrontation,” Hidalgo and Filoni added, explaining that this was how the two knew each other and why Maul mockingly referred to Ahsoka as “Lady Tano” in the Rebels season finale. “Even though this particular story really only exists as story ideas, some loose scripts, and things like that, we still consider it to have happened”, Hidalgo explained, “So that’s how we informed the writing in Rebels. Because that’s the history that these characters carry in their heads”. Ashley Eckstein added one final comment before the panelists moved on to the next section of the panel, “After the War”. “I will say that I knew part of that but to see it…is a whole different thing”. Whether we’ll ever see the Siege of Mandalore in any other spin-off media is anyone’s guess. 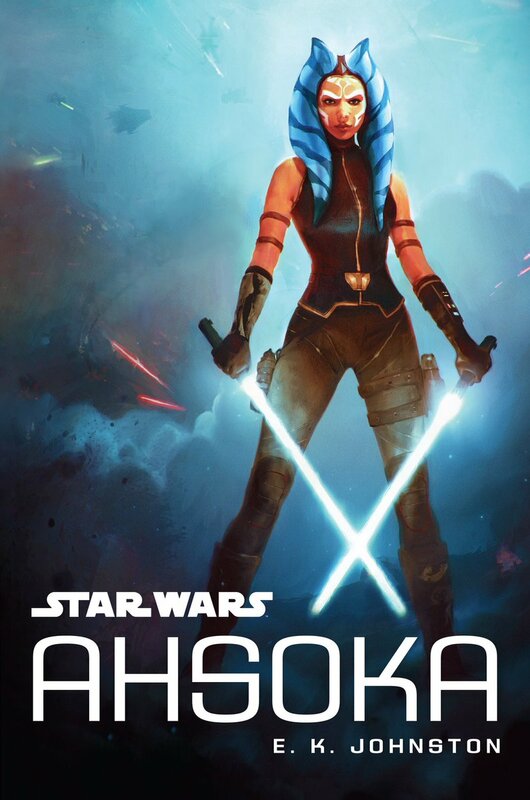 But one thing is clear: the fans are eager to learn more about Ahsoka’s final mission for the Republic. 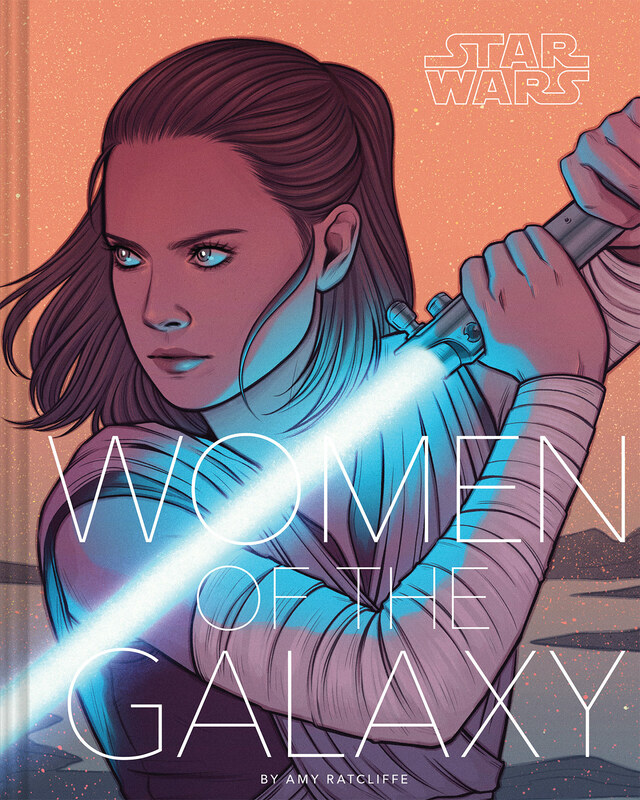 This article is the fourth in a series of articles on the “Ahsoka’s Untold Tales” panel from Star Wars Celebration Europe. 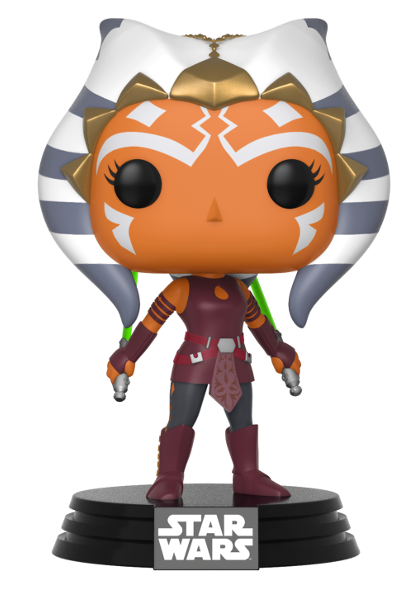 In the next installment, we’ll be looking at Ahsoka’s life in exile following the outbreak of Order 66.